Vermont Soap is a different kind of company. Our job is to make yummy stuff to replace all the yucky stuff that’s been clogging up our world. Every employee has a vested interest in bringing you the highest quality, most reasonably priced, natural and organic products possible. We bring an ecological mindset to our day to day operations. Products do not appear out of a vacuum! Every raw material and ingredient is put under a microscope, literally and figuratively. And we take the same approach to the sourcing of our packaging. Vermont Soap uses materials, equipment and services produced in the US and local to us wherever feasible. Green is a process not a result. 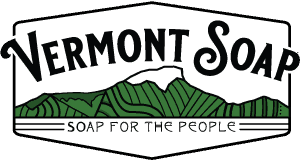 Vermont Soap is there with you on your journey toward a non-toxic work and home environment.